We didn’t know until recently that Before the Devil Knows You’re Dead would be the last film from the masterful director Sidney Lumet. Few saw it when it was released back in 2007, which is a fair summation of Lumet’s later career. Though the all-important edge remained in his work, especially this ferocious indictment of American family dynamics, the “classic status” of films like 12 Angry Men and Dog Day Afternoon was not achieved. By no means does this make Before the Devil Knows You’re Dead lose merit, but it is not a classic. All directors don’t get to end on masterpieces (Stanley Kubrick didn’t), but Lumet had the distinction of making them. With that, we turn to the film at hand. Lumet and the cast take a script by Kelly Masterton and inject some poison into it the best possible way. You can see the script reaches for Shakespeare with its feuding family and tragic outcome. King Lear will come to mind, though with the sons as the main characters. 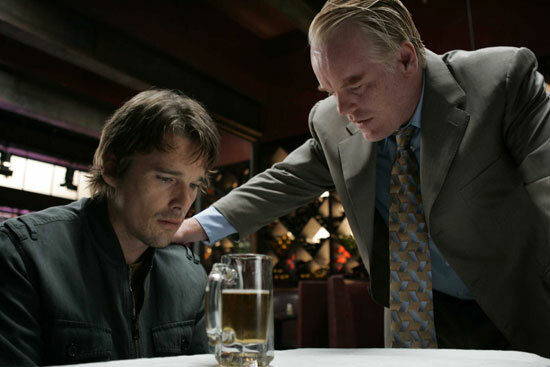 Thankfully, these two are played by Ethan Hawke and Philip Seymour Hoffman, who characterize them so perfectly that it’s a wonder their performances weren’t recognized. Lumet’s visual sense is almost strictly business. When Hank (Hawke) and Andy (Hoffman) hatch a plan to rob their parents’ jewelry store, there’s a wow scene from the beginning. A masked gunman enters the shop, gun raised at the old woman, who we don’t yet know is the boys’ mother. An alternately tense and funny scene with the robber and her has Lumet holding the camera where the customer usually stands to checkout, and watching the amateur at work. It escalates into blood, as robberies often do. Following the robbery is a disjointed narrative that shows us what each of the principle characters were doing prior to the robbery. It’s a flashy style that would’ve been tacky in the hands of a debut director. Lumet makes it fit. The actors all add to this heightened sense of reality with bursts of melodrama. Marisa Tomei delivers a terrifically low-key performance among all this, never resorting to screaming but still managing to steal many scenes. Albert Finney plays Charles, the father figure and the one who will be blamed by both himself and his sons for the way things turned out. Since the audience can see what a manipulator Andy is, hopefully that blame won’t sit on his shoulders alone. The implication of the father as the source of evil is more evident because the mother is almost entirely out of the picture after the opening scene. We don’t see her face devastated by what her sons have done, nor do we see her reaction. The end of the family is a topical theme for an American film considering the rising divorce rates here. Bitterness and resentment have been festering below the surface of this family for quite some time. This is not a meditation, it is a confrontation; not the full experiment, just the reaction. Lumet knew what he wanted out of this material, and he draws blood with an operatic score and devestating close-ups. Bruised faces and egos fill almost every scene and every frame. There are hints of psychological trauma when Charles tells Andy he’s sorry for how he was as a father. Hoffman is terrific in that scene and even better in the one after, where he has to pull over the car to vent his anger at his wife. These emotional wallops seem to be the entire reason of the film. The plot exists so that these characters can have them. Robbing your parents’ jewelry store, cheating on your spouse with his brother, taking revenge on your own flesh and blood- even the devil is going to have a hell of a time with that. 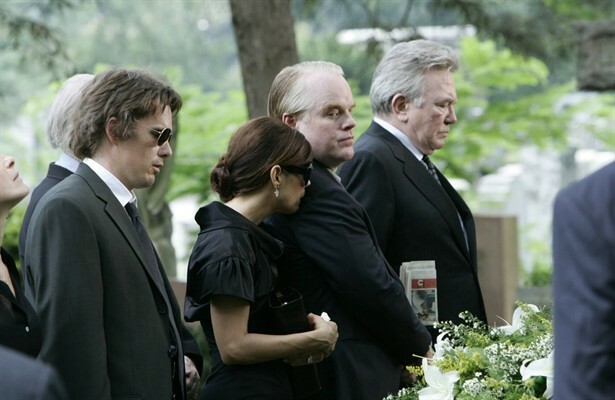 This entry was posted in Reviews and tagged 12 Angry Men, Albert Finney, Before the Devil Knows You're Dead, Director's last films, Dog Day Afternoon, Ethan Hawke, Marisa Tomei, Network, Philip Seymour Hoffman, Sidney Lumet, Sidney Lumet death by matterspamer. Bookmark the permalink.